Is it right to write off Gene Editing? 2019 can be a game-changer for bioscience industry? India offers a huge opportunity to healthcare at home business! Agricultural intensification not a “blueprint” for sustainable development? 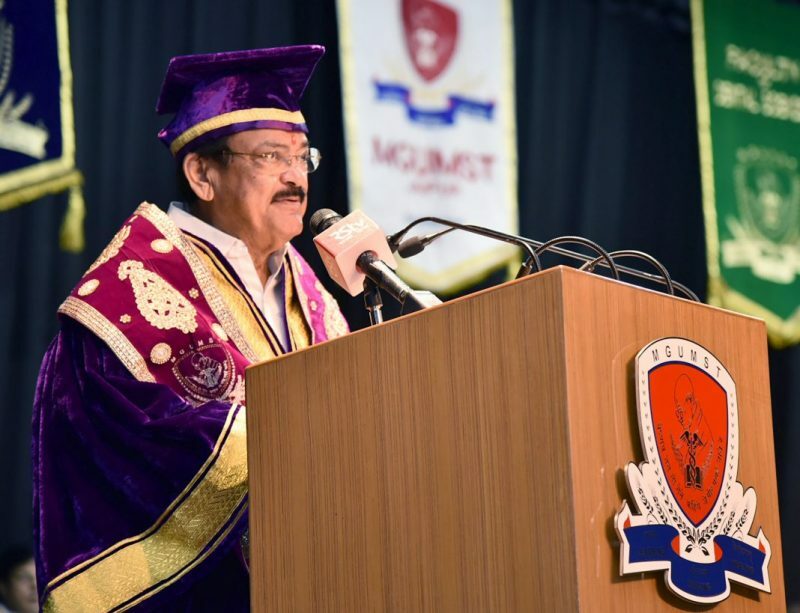 The Vice President, Mr M. Venkaiah Naidu addressing the gathering at the 3rd Convocation of Mahatma Gandhi University of Medical Sciences & Technology, in Jaipur, Rajasthan on March 25, 2019. New Delhi: The Vice President of India, Mr M. Venkaiah Naidu has called for medical universities to introduce teachings in human values as a part of the curriculum to inculcate moral, social and ethical values in students. He was delivering the 3rd Convocation Address of Mahatma Gandhi University of Medical Sciences & Technology, in Jaipur, Rajasthan recently. Mr Naidu appreciated the rather young University for having blossomed into an important center for providing quality medical education and healthcare in a short span of time. He complimented Dr M.L. Swarankar and his team for their commitment and dedication towards making the institution one of the foremost centers of excellence in terms of quality teaching, training, research, innovation and affordable patient care in India. Stating that education laid the foundation for the progress of a nation, the Vice President said that the right kind of education would inculcate citizenship values, liberate people from ignorance, empower them with knowledge, information, skills and equip them to take up new roles and responsibilities to shape not only their own destinies but also the destiny of the nation. The Vice President opined that educational institutions for higher learning have to develop a system to impart relevant and right type of education integrated with skills. ‘India’s educational ethos needs major reforms in the context of changes that are sweeping the country and the world’ he added. Urging universities to deliver a more comprehensive medical education, which develops the total personality of the young medical graduates, Mr Naidu called for the inclusion of subjects like medical ethics, human behavior sciences, philosophy, culture, heritage, meditation and Yoga in the curriculum. Imploring the students to ‘Never give up’, the Vice President said that neither success nor failure is permanent. ‘Believe that perseverance, hard work and unshakable determination – shall always triumph’, he emphasized. Shri Naidu highlighted India’s achievements in providing basic and advanced health care since Independence and raised caution against the twin burdens of communicable and non-communicable diseases that India is bearing today. Speaking of lopsided infrastructure development in the health sector, the Vice President called for the provision of state-of-the-art healthcare facilities in the rural and remote areas on par with the modern hospitals in urban areas. Mr Naidu urged the private sector needs to supplement the efforts of the government, especially in bridging the urban-rural divide. He also suggested to make it mandatory for MBBS graduates to serve in rural areas before granting the first promotion to them in a bid to overcome shortage of doctors in rural areas. Observing that in India Doctors are considered next to God, the Vice President said that it was the cardinal responsibility of all those entering the medical profession to uphold the trust and confidence of the patients who seek treatment from them. The Vice President reminded the students that they were members of a noble profession and asked them to always remain committed to upholding the Hippocratic Oath. ‘Maintain the highest standards of ethics and integrity at every stage’, he told the graduating students. Speaking of the affordability of medical care, Mr Naidu said that medical costs were mostly met out-of-pocket by the people in India. He expressed deep concern over the debt trap into which impoverished patients got into due to medical treatments. He expressed happiness upon the launch of Ayushman Bharat – National Health Protection scheme to provide universal health care to 500 million poor and vulnerable people. © Copyright © 2018-2020 BioVoiceNews.com All rights reserved.